It was the battle of the divas on American Idol Thursday night as Nicki Minaj jokingly took a stab at Jennifer Lopez being the only female superstar judging the popular singing competition. The MC performed her latest single “Starships,” wearing a tiny dress that barely covered her curvaceous figure. “I want to be a guest judge,” Minaj told American Idol host Ryan Seacrest. 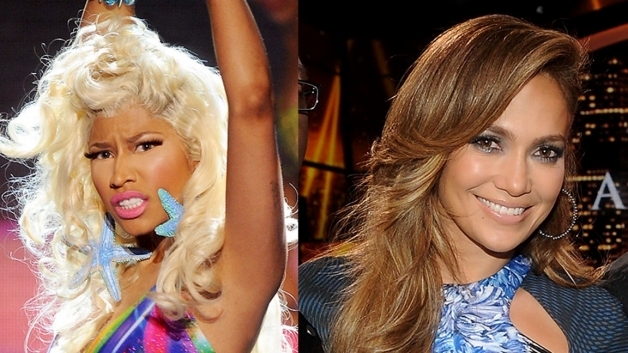 Jennifer Lopez didn’t mind that telling Minaj to “come over.” But it was when Minaj asked “JLO can you scoot over?” that the Bronx diva was quick to mark her territory. “I don’t think there is enough space for the both of us,” Lopez replied with a smile. Minaj, a native from Queens was all giggles with Seacrest as he told the audience “Starships” is one of his favorite songs. “Hello cute thing,” said Seacrest. “There were parts of the performance that were high risk,” he said, in reference to Minaj almost slipping out of her barely-there dress. The rapper avoided having a wardrobe malfunction by toning down her dance moves and opting to pump up the crowd instead, letting her backup dancers do the moving. “Who wants to party right now?” Minaj yelled. The crowd responded with a loud roar. Last year’s American Idol winner, Puerto Rican singer Scotty McCreery, took the stage and had the fans going wild. “Feels like it was just yesterday,” McCreery told Seacrest about winning American Idol. To McCreery’s surprise, Interscope Records executive and mentor on the show, Jimmy Lovine, came out. McCreery was speechless. 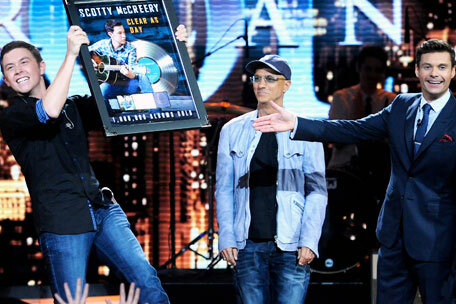 Lovine handed McCreery a nicely encased platinum album. “On behalf of Interscope and Universal music studios we’d like to thank Idol and the judges that picked you out of that crowd on the rainy day,” said Lovine.“[He is the] youngest male to have his album hit Billboard’s Top 200,” Lovine added. McCreery, visibly stunned, was all smiles. To date, McCreery’s freshman album “Clear As Day” is one of the highest selling debuts from an American Idol winner, selling over one million copies in the first three months, The Hollywood Reporter stated. Billboard magazine also named McCreery top new Country artist of the year in 2011. And he won the distinguished “New Artist of the Year” award at the American Country Awards last December. McCreery also became the youngest male singer in music history to open at number one on Billboard’s all-genre chart with his first album. “Clear As Day” stayed at number one for six consecutive weeks. God Bless and may you have a fabulous day!